Designers TracyReese and Kati Stern for Venexianashowed their fashion flair for Fall 2010 under the tents of BryantPark during Mercedes-BenzFashion Week in New York.Although fall is still months away, join LuxuryExperience as we bring you a preview of what to look for Fall 2010from these two talented designers. Ladies, are you ready for the season? 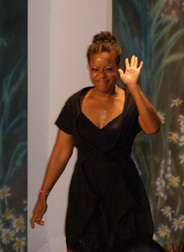 DesignerTracy Reesecreated an exciting women's collection for Fall 2010 consisting of 40 sumptuouslooks. Attention to detail has been Tracy's signature since launching her brandin 1998 and the collection is gorgeous and very wearable; look for draping ondresses and blouses, ruched skirts and dresses, stirrup pants, embellishments,studs, and appliqués for Fall 2010. Tracy works hermagic using fabrics of lace, lacquered jacquard, crepe, jersey, faux leather,suede, and sensually soft alpaca for her sweaters, and utilizes a color paletteof blush, custard, smoky blue, fawn, nougat, heather grey, wheat, ecru,bittersweet, black, spruce, and jade. There were manyhighlights in the Fall 2010 collection including Tracy's Blush Embellished Frock which was delightfully feminine and alighter than air confection, and her SmokyFloral Appliquéd Shell and Cosmetic Spots Jersey Ruched Skirt that was sexyand sophisticated. Other highlightsincluded an Expressionist Grid DrapedShift; a Wheat Draped Chemise andFawn Crepe Bustier; a GreyDistressed Faux Leather Coat and Jade Appliquéd Cami Slip was anotherattractive look with its attention getting design on the front of the dress;and a Smoky Blue Fringe Jacket, SmokyDraped Surplice and Bittersweet Stirrup Pant. However, theshowstopper was her grand finale look, a stunning and elegant Black Lace Gown. All of the looks werein the collection were paired with Highline United for Tracy Reeseshoes. Tracy Reese haslong been a fashionista favorite, and the many celebrities spotted in the frontrow at the packed house show included actresses Julia Stiles, KristenBell, Michelle Williams of Destiny's Child, and AdrienneBailon. 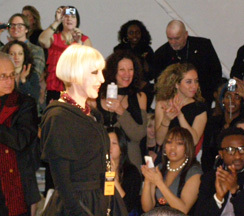 Once again, Designer Kati Stern for Venexianaimpressed at Mercedes-Benz Fashion Week inNew York withher Fall 2010 Collection. Stunning and sophisticated with a rock edge to herhaute couture, Kati Stern's collection of 54 dazzling looks clearlydemonstrated her talent for eveningwear. The fabrics aresensual; velvet, French organza, chiffon, taffeta, tulle, French lace, woolchallis, silk, satin, brocade, silk plisse, and slinky silver lame, and areembellished with hand beading, Swarovski details, and ultra glamorous fur. Hercolor palette for the collection includes de rigueur black for evening, as wellas silver, gold, white, taupe, lavender, lilac, violet, azure, midnight blue, sea green, tobacco,sea foam, and lido green. From Kati'scocktail dress collection, a few of the highlights included a Metallic Gold Draped Cocktail Dress; a Silver Lame Short Evening Dress; and a Silver and Black Lace Cocktail Dress.An asymmetric, one-shoulder velvet dress enhanced with embellishments stoodout, as did a gold strapless dress with ruched bodice, waist detail, and goldunderlay. The gowns in thecollection were exquisite, notably a slinky and seductive Black Beaded Evening Gown with Black Tulle Plisse Neckline; a blackstrapless Fishtail Polka Dot Gownwith tulle overlay; and a high glamour Tobaccoand Brown Voided Chiffon and Velvet Hand Beaded Gown. An Iridescent Lilac Taffeta and French LaceGrand Evening Gown was another show highlight with its belle of the ballhigh drama; a strapless Violet SilkOrganza Tiered Grand Evening Gown featured three luscious tiers; a Sea Foam and Gold Voided French OrganzaGrand Ball Gown was another standout; and a "Young Victoria" Sea Foam Beaded Silk Plisse Grand Evening Gown wasalso wonderful. Then there werethe furs; Kati knows how to turn heads, and a few of the highlights in thecollection included a Leopard Print Furwith Fin Raccoon Collar and Cuff over Black Sequin Pants; a Silky Karakul Boxy Jacket with Gold RussianSable Detail with Bouffant Python Skirt; a Fur Coat with Black Mink Gauntlet Sleeves and Black Python Bow Belt;and a Black Mink Jacket over BlackVelvet Beaded Short Skirt. Spotted in thefront row at the Venexiana show were Stefania Fernandez Miss Universe2009, and actor Mark Indelicato. As always,remember, that when it comes to fashion, it is not only about what you wear, itis also, how you wear it! Know your own style and have a fashionable season! For informationon Mercedes-Benz Fashion Week in NewYork or other Mercedes-Benz Fashion WeekInternational shows, please visit the Mercedes-Benz Fashion Week websiteat: www.MBFashionWeek.com. © April 2010.Luxury Experience. www.LuxuryExperience.com Allrights reserved.